Dimplex continues to lead the way with ever-evolving technology development for today's electric fireboxes. This black, single pane door is made from tamperproof glass and will make the perfect complement to the well-loved dancing flames and glowing embers in your Dimplex electric firebox. It is designed for use with the BSFL33 model. Add to the realism of your electric fireplace with a beautiful glass door to enclose the flames and create the appearance you expect from a traditional fireplace. Your fireplace will be the focal point of any room and this door will lend an element of chic sophistication and traditional design to Dimplex's signature firebox. I am planning to order the slim Dimplex BFSL33 which already comes with glass. Why would this glass door be needed? 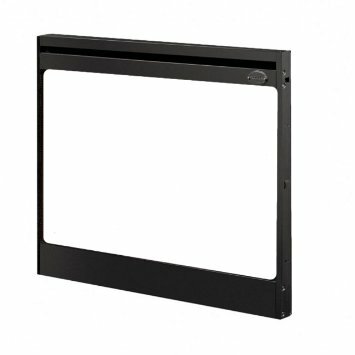 This glass door accessory is manufactured from a lower reflectivity glass and serves to create a double pane effect, maintaining lower temperatures on the glass surface.